How do you fight the madness? The kind that makes your heart ache and goes against everything you've ever been taught to believe about humanity? If you're me, and you can't stand any of it, you turn to cinema. Cinema with a conscience that is. Berlinale, it turns out, is a great place to be and do that this year. Film after film, including the opening oeuvre Django by Etienne Comar, is fraught with references from the past, present and future about what we are experiencing right now. And how we could try to change it, perhaps. 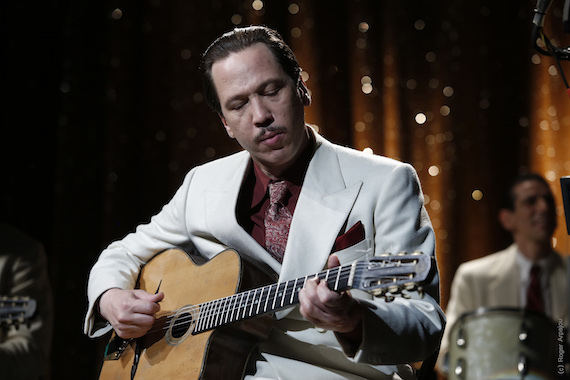 Django stars one of the most charismatic actor in world cinema at the moment Reda Kateb, as Django Reinhardt, a figure we may find both problematic and inspiring today. Problematic because people who are bestowed with great gifts often remain untouched in dire situations because their talent makes them different from others, from commoners hailing from their same race or having experienced their upbringing. Inspiring because Reinhardt shows us that courage can be a very quiet thing, not a shouting match but a gentle gesture of survival. And with his survival, he somehow managed to save most of those around him at a time when the Roma people were persecuted for being different, by Hitler's goons. See a parallel with today's world? Yup, me too. Watch an excerpt from their press conference, where Kateb talks about art changing the world... And sometimes not always for the better. Starts around 1.20 minutes into it. Comar's film is a perfect tribute to the legendary Gyspy guitarist, languid but bubbling with endless possibilities as Reinhardt himself must have been. And his ending, a haunting last image the filmmaker leaves the audience with, tore me to pieces, allowing me the good cry that was badly needed in these uncertain times. Kateb is mesmerizing of course, as he was in Venice in Wim Wenders' The Beautiful Days of Aranjuez, which incidentally is screening in German cinemas at the moment. Another gem at this year's Berlinale is John Trengove's The Wound starring South African singer, songwriter and novelist Nakhane Touré as Xolani, a star all around. Having premiered at Sundance, to audiences that both appreciated and inquired about it intelligently to the filmmaker's delight, I was fascinated by the film's haunting feel. There isn't a moment that goes by during The Wound where things turn out as expected, and this idea that some traditions in the Xhosa culture allow for a thin line to be drawn between virility and sexual vulnerability was truly mesmerizing to watch. It was in large part due to a fantastic script, co-written by Trengove, writer Thando Mgqolozana and Malusi Bengu, and his brilliant choice of casting, Touré flanked by Bongile Mantsai as Vija and Niza Jay Ncoyini as Kwanda. The film opened the Panorama section at Berlinale. Music and the wonderful personalities that make up that world are turning out to be a primary focus in this year's line-up at Berlinale. Or perhaps in search of respite, I've been drawn to films that offer that. Insight into how art, and artists, can change the world for the better. More on the interviews with the filmmakers and their stars in the next "Diaries", but for now, I leave you with Django's beloved "Nuages", a song which during WWII became an unofficial anthem in occupied Paris for those yearning for liberation. Still from 'Django' by © Roger Arpajou, 'The Wound' by © Urucu Media, all used with permission.